Get ready for a second magical journey to the world of Someday's Dreamers, where spellcasting is a profession that requires both the proper training AND a license. It's to get that license and fulfill a promise made to her late father that young Sora Suzuki has made the long journey from her distant home in the countryside town of Biei to the big city of Tokyo. It's a daunting challenge, but she's got a little bit of talent, a charming personality and, most important of all, the promise of an internship! What she ISN'T expecting, though, is how different life in the city will be, especially the people themselves. While she gets along with the confident Asagi, Kuroda and the gentle Hiyori, she's completely confused with the mysterious boy Gouta. And yet, as a result of their internships they keep ending up in the same situations and slowly learning to understand more about each other than they ever imagined possible! Every now and then, anime shows us a world wherein people smile more often than they do in actuality. From the very opening sequence of Mahou Tsukai ni Taisetsu na Koto - Natsu no Sora it becomes apparent that it is one of those precious shows. 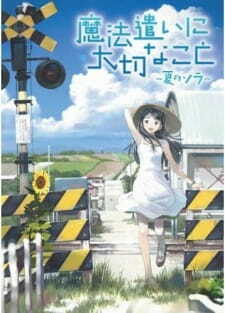 Though it seems a sequel to the 2003 Mahou Tsukai ni Taisetsu na Koto, they only share the same fictional rendering of Japan and it is not necessary to have watched the earlier show to appreciate Mahou Tsukai ni Taisetsu na Koto - Natsu no Sora (hereinafter, Natsu no Sora), as all characters and most of the setting have changed. Within the fictional universe of Natsu no Sora, magic is real. So much so, in fact, that it is considered a commodity and performing magic is a service industry. While the ability to perform magic is still a rare gift, the presence of mages is part of society, meaning that the populace at large will not be stupefied when witnessing it. The interaction of magic and society as a whole is touched upon: the show makes it known that there are laws and regulation for performing magic and that all mages must be registered, and mention is made of magic being used in national defence. Yet what the viewer is presented with is smaller-scale magic used in the practice of everyday life. The magic we see is of a constructive kind, sweet and helpful: broken chinaware is mended, lost items are retrieved, dolphins stranded on the beach are helped back into the ocean. The magic itself being rather small in scale and quite homely, it becomes clear that it's an extra, something that enhances the plot instead of shaping it. What the show mainly presents us is a glimpse in the life of a small number of mages in training who receive their education during the Tokyo summer. Protagonist Suzuki Sora, a kind, smiling and innocent 15 year-old, fresh from a country town in Hokkaido, and a few of her classmates that have converged in Tokyo for a few weeks are mostly seen wandering parts of the city and taking in the sights of summer. For most of the show, the actual happenings consist of the achievements and failures of the mages as they try their hand on professional magic and of the interactions they have with each other and the inhabitants of the city. All is calm and gentle, devoid of the outrages of joy and tragedy so prevalent in most shows, and the story happily takes a backseat and shows us the characters' discoveries of small-scale wonders such as a street corner singer who sings for a daily growing audience, the diverse sights of a shopping mall and the sunset over the sea at Enoshima. There are a few cheap jokes added, but since, for once, these manage not to be to someone’s expense they actually enhance the general cheerfulness. And, slowly, it shows us how the characters get to know each other better, their feelings evolving into friendship and a sweet and innocent puppy love. Of course, not all goes well all the time, and the characters have to struggle with failure in their training and the small fights and arguments that will certainly erupt between people, but most of the time things can be talked over without having to resort to emotional outbursts, as the show takes for granted that everyone will, in the end, try their best to help out in any way they can. One would suppose that having a romantic relationship enter would steal the focus away from the cheery setting, infusing it with sudden passion and emotion that comes too late for a show of this length. Sadly, it does, even managing to have one of the protagonists have one of the very standard and clichéd secrets that almost promised to destroy any developed story. Natsu no Sora, however, has the good graces not to have this come to the forefront for too long and without too much fuss once more embraces the highly satisfying happiness of summer. Given how much time is spent showing parts of Tokyo in summer, it should be no surprise that the art is gorgeous. Consisting mostly of photographs with a thin animated overlay, the background show us diverse sights of a city bathed in sunlight and occasional shadow. Superimposed on these stills is the hustle and bustle of people going their business, cats yawning and stretching and traffic moving purposefully. All these latter elements are drawn in a rather minimalist animation style which contrasts sharply with the realism of the background and makes it quite clear what the focus of the eye should be upon. In very many cases, this focus should be on the smiling faces of the people inhabiting this fictional world. The main characters as well are devoid of many details. Their facial features consist of rather simple lines, angles and curves, giving all of them a distinct facial shape accompanying their personalities. This lack of detail gives them very clear expressions, a wide range of which are visited. Lips and lip sync are done very well, yet ever better are the many shots in which the camera's focus is on a character not speaking but replying only by means of her visible expressions. Moreover, what the characters lack in detail they gain in a very well developed sense of poise, the way they're standing, walking and sitting oozing personality, be it shuffling in a slump or happily moving with a spring in the step. As varied and contrasting as the major art styles are is the music. Natsu no Sora has one of the more diverse soundtracks of the series coming out lately, with music ranging from a cheery flute and fiddle, via the rock/pop of the street corner singer, who we hear singing a different song every few episodes, to what the show itself describes as 'British new wave electro'. Despite the variety, most songs are happy or uplifting, with only a very few sadder pieces added to the mix. To this diversity is added a distinct way of using it: music is considered a part of the background and often switches with the elements of setting show. An example of this switching, which is by and large done exceptionally well, is the aforementioned shopping mall, where the music changes with each shop visited, culminating in silence on a floor that is empty. The best element of the sound in Natsu no Sora, however, would be the use of voices. Unlike most shows, the camera doesn't always focus on the person speaking, showing equally often the listener, resulting in the voices coming from outside of the screen. This enhances both the feeling of being in the conversation and the effect of noting the expressions visible on the faces of the listeners. Moreover, many sounds coming from elements outside of the screen altogether add to the idea that the show is set within a living, breathing world. As said above, characters are easily distinguished graphically and are able to express a wide range of emotions. Most characters of importance are fairly young and innocent kids who spend their days in pleasant companionship, though, of course, they all have quite distinct personalities that blend well together even if these are somewhat clichéd: from the sweet and innocent Suzuki Sora and the initially brooding yet kind-hearted Midorikawa Gouta to the domineering but insightful Asagi Honomi. Most of the characters are also given a personal quirk, which is something of a cheap shot yet works remarkably well to give them personality. A good example would be Asagi’s tendency to always call people by both their family and given names. Most importantly, because all of the characters are, by and large, kind and content folk, talking in pleasant tones and properly polite, the few times that their rawer emotions come out are special and memorable and, hence, have far more of an impact than even the most dramatic scenes from most other series. Natsu no Sora is a show that moves slowly through summer days, both of the city and of the characters, and that shows the best both have to offer. We are invited to simply take a look around and see the simple beauty in many small things, leaving for a while those issues of importance that elicit stronger feelings. Calm and cheerful conversations, subdued and down-to-earth negative emotions and an innocent love are bound to make you smile for a bit and help you recuperate from the generally completely irrational outbursts of emotion most other shows bombard you with. Sweet, simple and charming it makes you look upon a potato harvest, city highlights and a sweet girl's smile with the same feeling of contentedness. Very rarely do I give an anime a 10. For me, that rating is sacred, it consists of the holy grails of my specific choice in anime genre. So for a spin-off to get a 10, is even more-so impressive. Mahou Tsukai ni Taisetsu na Koto ~Natsu no Sora~ is not an ordinary anime by any means. I have no idea why it would be rated as 7 or below by so many people unless they are incapable of viewing this for what it truly is. As a very picky anime viewer, I must say that the art work in Mahou Tsukai ni Taisetsu na Koto ~Natsu no Sora~ is impeccable. I found it interesting that the characters were drawn so simply while the atmospheres they were in were so vastly realistic, and in some case, downright cinematic and photographic. The amount of detail and precision in the artwork is fundamental to the stories depth and the intellectually of the whole anime as a product. If you love great art in anime's, you will love going through each episode and trying to guess which scene was filmed, which was photographed, and which was a mix of drawing, photography, and film. It's not easy at all to fit all of these components together and make it worth watching, but this anime achieves it so well that it has SPOILED me for many other anime's. My expectations have increased so much more than they were before. Story wise, it's simple. Not dumb simple, not plain or ordinary or boring simple. It's classic simple. It's rich in detail, rich in curiosity, and pleasurable to the mind. Instead of dragging you on a million mind bending twists and turns to distract you from the flaws of the anime (in my opinion there are almost NONE), it gives very well chosen moments to leave you going "wait, what just happened" and as in my case, gripping your pillow in eagerness to find out what's developing. The story may seem slow paced to some, but have patience, the entire point of this anime is patience. Learn to love it for what it is. It is art, it is the emotions and fears that we all have somewhere inside of us. Character development is basic. I like that. Yes I love character growth, and this anime does have it, quite a lot of it actually. It's subtle though, natural. Like real life. No one changes from one day to the next, and a good anime will remind us that not even magic can change someone from night to day. An individuals maturity develops over time, and the pace of this anime makes it so that we grow with the characters too. In all of its efforts to display the characters as real as possible, Mahou Tsukai ni Taisetsu na Koto ~Natsu no Sora~ has succeeded. Their faces are sometimes simple, not overly done. This allows us to really know them for their stories and personalities, and not for the surface alone. Overall, this has now become one of my top five favorites, and I'm so stubborn about anime that really, it takes a very good anime to make me budge on any of my current favorites, but this one just bumped one of them off and it's a spin-off for goodness sake. I'll say this much though, since I've praised it to death. Not every anime fits every person. I do suggest watching this, as much as I suggest watching Beck or Noein, but if you don't enjoy it, it doesn't make you any less deep than anyone else. Everyone develops at a different rate. If you don't like it now, you might like it in 10 years, maybe never, but it just might help you figure out where you stand on art, affection, and cultural exploration. These are all pretty great things. It should be said that this Mahou/Magic based story does not follow it's predecessors normal pattern of using Bishounen characters. However, it does have a similar feel as Mahou Tsukai ni Taisetsu na Koto and story arc. However that's about it, Natsu no Sora takes a very Humanistic approach to Anime. You might even go further by saying that it is simply a story about the human condition, told with the help of Magic to illustrate important aspects of our struggle. I was very impressed with the very loving and calm nature of the main character Sora Suzuki. Her purity and naivety really set up some truly transcendent moments. The blend of music and amazing cgi graphic art really drove this story home for me. I've read complaints from other reviewers that the 2d characters placed into this almost realistic cgi atmosphere didn't mesh right. I just thought this series was amazing. The story is not fluid, every episode stands on it's own, but in the end all paths meet beautifully. I did feel like I wanted more, but realized that this series had already made me travel through so many ranges of emotion that I can't help but feel this work did an amazing job in the Mahou category. The beauty of this work was in it's very simplistic and subtle method of story telling which used a really great musical soundtrack to set the mood, along with it's message of peace and love for one other and the earth. There was a lot of Transcendentalism and or Shinto/Buddhist philosophy behind the core morals of this creation. The Only criticism I have with this work was that it's simplistic approach really became hard to watch around the third episode. It took me a while to finally finish this one because it stalled episodes 3-8, but then began to get really interesting again after that. I kept waiting for something really dark or evil to occur to off balance all of the good, but nothing really ever developed. If you've ever seen the french movie &quot;Innocence&quot; this series has very similar approach and feel. Mahoutsukai ni Taisetsu na Koto: Natsu no Sora is based off of a manga series by Yamada Norie. Technically, it’s the second part of the series but it’s also the one I was asked to review and it looks like it’s set in the same universe as the first, but unrelated. Hal Film Maker handled the adaptation. You may remember them as the studio behind such anime as Bottle Fairy & Dokuro-chan. Given that one of those was quite good and the other was shite, I don’t know what to anticipate. So, let’s just look and see. We open with our heroine, Suzuki Sora, being accepted into a month long program to become a mage. Because, apparently, magic exists in this world and you can master it in a month. That’s something that immediately bothers me. Being a mage is presented as a great thing that opens up all kinds of doors for you or that can, in and of itself, serve as a comfortable career. But they recruit for it by having a bunch of sixteen year olds study for a month. This world is kind of dumb. From there, we see Sora and her classmates go through the training. The most pervasive issue with the series is simply that it’s kind of boring. We’re watching a bunch of under-written characters do relatively mundane things. Which you might think is strange when the series involves magic, but we’re looking at requests to “clean up my messy house and find this thing” or “open my safe.” It’s not exactly a dynamic, exciting way to use magic. The closest we get to that is Sora stopping a crashing vehicle in the very beginning. Which is not reflective of how magic is used for the rest of the series. The romance is also a bit rubbish. You know there’s going to be a romance the moment Sora’s friend talks to her about how she “needs a boyfriend.” You also know who it’s going to be because he’s the “kind of distant” type of dude that makes for a very trite romantic interest. The actual set up for the romance is pretty bad though. It’s pretty much “they’re living together during their training and sometimes they faff about Tokyo together.” But there’s never any chemistry betwixt them nor is there a real sense of development for their relationship. The closest the series gets to being interesting is having Sora go beyond her clients’ magic requests to try and make their lives better. At those points, the series shows what it could have been. They aren’t great scenes but they’re, at the very least, decent. All two times we see that happen. I already mentioned the characters being under-written, which is a big part of the series itself being boring. Slice of life style series work when the characters are either funny and endearing or really well developed and compelling. This series has characters that are just archetypal. They aren’t interesting nor is the series funny. Which not only makes the series uninteresting but renders the tragic element ineffective. The artwork doesn’t help the series. The facial expressions are highly lacking with most scenes giving the characters blank looks. A lot of the art is fairly minimalistic. With details being left out like the animators were on a severe time crunch and could never actually finish an episode properly. Don’t get me wrong, it doesn’t look bad, just kind of lazy. This series got some actors I’ve heard before and have respect for the abilities of. Like Hanazawa Kana, Inoue Marina, Namikawa Daisuke & Takahashi Mikako. The direction in this, however, is not very good. They’re clearly going for slow, deliberate delivery but a lot of the time the result is that the characters sound bored. Rather like I was watching the series. The music is the best element in the series. There’s an ongoing thing with a blonde woman, voiced by the singer Sasao Miku (micc), performing songs. And they’re really good. There’s one part where some random background character I can’t remember the name of says he’s fallen for the male lead. Which might or might not be him joking. It never comes up again so it doesn’t really matter. Have the program for becoming a mage take longer. You don’t have to show us the whole thing, but a month for that is dumb. Either lose the romance entirely or properly develop it. I don’t really care which but as is, it’s not interesting or well handled. Focus more on Sora going beyond to try and help her clients. Like I said, these moments are where the series is most interesting. If you had her trying to help improve clients’ lives as a bigger part of the series, this could have been a decent anime. Ultimately, this is not a good series. It’s not interesting. The artwork and animation come across as lazy. The directing results in bland performances and the characters are under-written. That being said, I can’t say the series is bad. Most of my issues come down to it being boring and seemingly lacking any effort into making it anything but trite. So, I’ll give it a 5/10. If the premise of mages training for a month to do minor errands with magic seems interesting to you, go ahead and try it. Overall, I don’t recommend it though. But definitely look up Sasao Miku’s music.